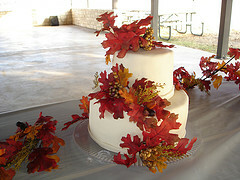 A fall autumn wedding cake is essential to having a successful fall wedding. 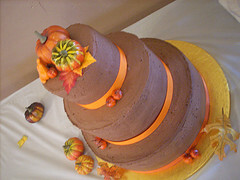 As with any season, fall offers many great colors and accent items that work great as cake decorations. 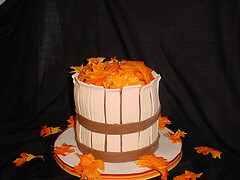 Below are photos of fall cakes to give you an idea of some of the possibilities. 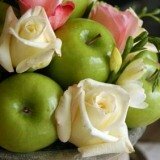 The addition of fall flowers, leaves, pine cones and other fall accent items can make all the difference. 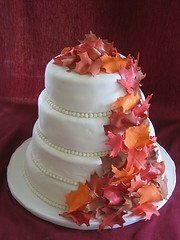 These items can take an ordinary, traditional wedding cake and turn it into a very special autumn cake. 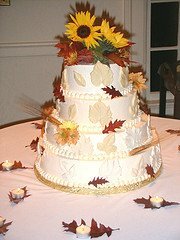 Adding fall flowers and leaves to your cake not only adds a splash of color, but it also helps to finish off your wedding theme. The leaves on this cake look amazingly real, however the are made of gumpaste. The entire cake is completely edible. Fresh flowers can brighten up any fall autumn wedding cake, and sunflowers are no exception. Notice the use of leaves and votive candles for cake table decorations. 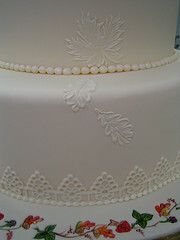 A little more subtle, this cake features beautiful fondant leaves that match the color of the cake. The leaves definitely add an elegant touch. Accent items like pumpkins and pine cones make great decorations and can also be used in your cake design. 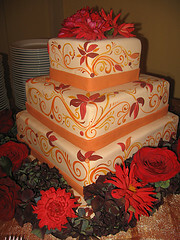 This cake has an colorful, intricate design that is perfect for an autumn wedding. The addition of fresh flowers finishes it off nicely. Pumpkins and gourds are sure signs of fall, and they work very well as cake decorations. Use pumpkins as table decorations even if they aren't part of your cake design. Pine cones are another sign that fall has arrived. They can be used on your cake and also as decorations. Your imagination is the only thing holding you back when it comes to cakes. Put your creativity cap on and check out these examples. This is a fantastic example of a creative cake. It was designed to look like a basket holding leaves. Work with a good cake designer to come up with a unique design for your cake. 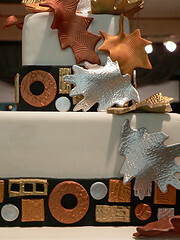 Modern and edgy, this cake has metallic leaves and shapes. 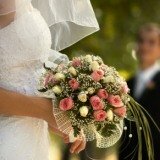 The detail is amazing and sure to catch the eye of your guests.